I was impressed with the pillowcase's quality when I received it before sending it on its merry way to my sister to give to her daughter. The mom-to-be received it yesterday. It hit the spot. The nursery has a cute (as opposed to scary) dinosaur theme. I'm hoping the future rugrat will learn to spell his name before preschool thanks to this pillowcase. My 4 year old grandson loves his new pillowcase. He walks around the house with his pillow so every can see his name. The grandchildren loved having their own personalized pillowcases for overnighters. 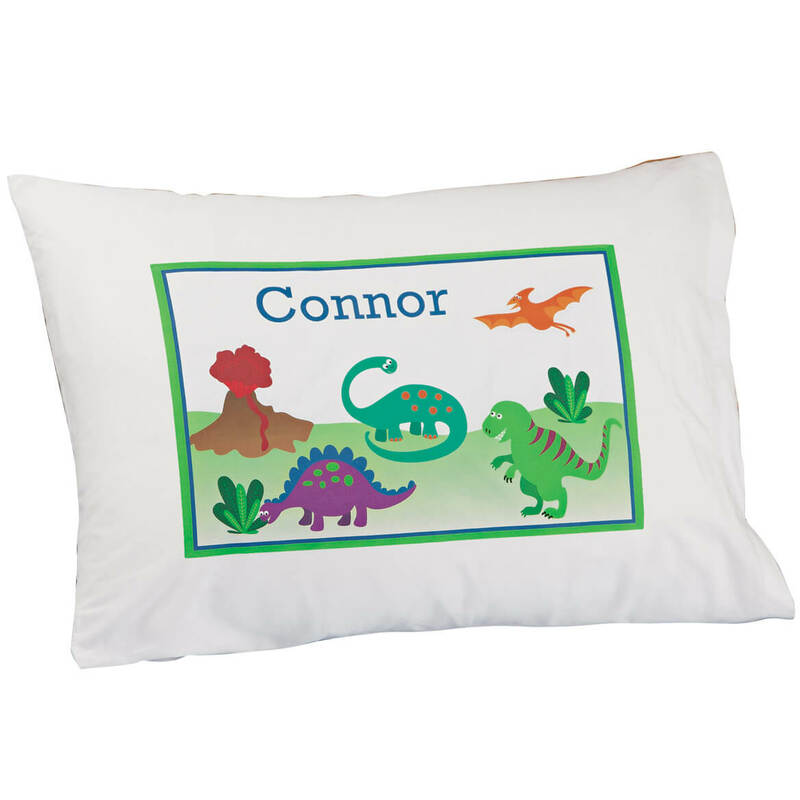 I purchased two of these personalized dinosaur pillowcases for my twin grandsons. They are intrigued with dinosaurs so this is a perfect gift for each of them. I have not given these pillowcases to them yet as they are a 4th birthday present next month. I know they will love having their own "personal" pillowcase. My grandson loves dinosaurs and loved this when he seen it. I bought this product for a 4 year old granddaughter's birthday party. She is crazy about dinosaurs. She is going to be so thrilled when she sees this! It is colorful, has a great scene on it, and has her name on it! What more can a kid want? It is good quality material and well made. I can't see anything wrong about it. 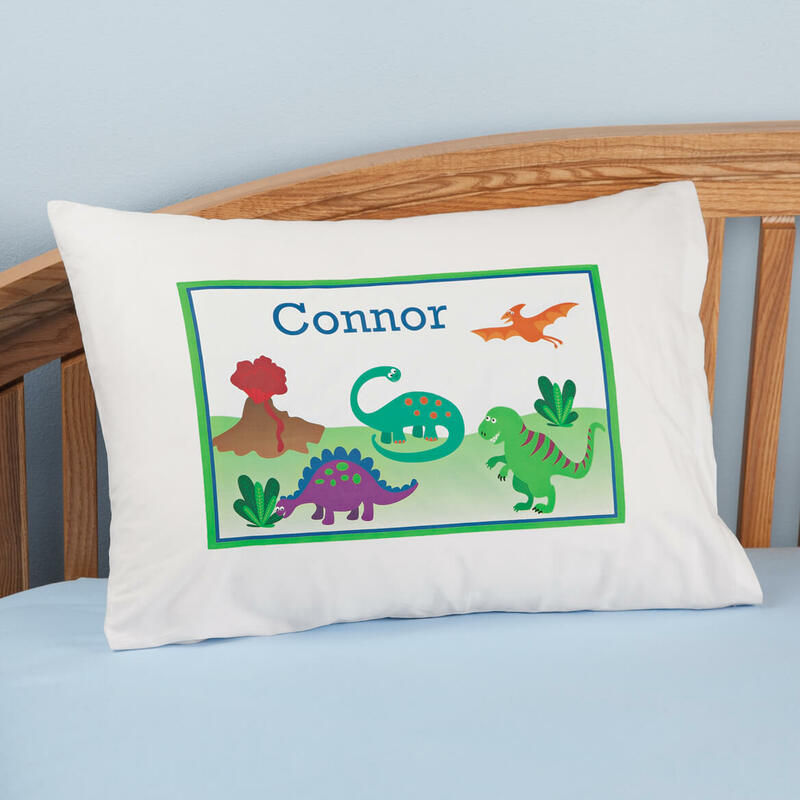 It's very special to have a pillowcase with our grandson's name on it when he visits, and he loves the dragon since it's his nickname, too. Cute item. Like to have grandson's unique name personalized on items since it is not common. My son loves dinosaurs and it was a great price! another grandson, another pillowcase, good quality, great buy. I don't see any items with my Grandson's name so I have to make them my own. His name is Dalon. The price was great for two of my Grandsons, and I was able to put there names one! I thought two of my grandsons would enjoy seeing their name on a pillowcase. Nephew loves dinosaurs and he will enjoy this. & LOVES DINOSAURS...M/K HAS GOOD QUALITY ITEMS. Cute, good price and will never find names already printed. For my grandson who loves dinosaurs. Looks cute and I thought the little one could learn to recognize and spell his name. I chose for a grandson but DID NOT receive. I got one for my first grandson and have to be fair to my second. Kids love to see their names! Something personal is always fun for children. My grandson says he want to be a dinosaur for Halloween this year. Having his name on the pillowcase is a perk. I thought my grandson would like to have his own pillowcase. my grandson,(3yrs) has a new bed and this pillow case will look great on it.